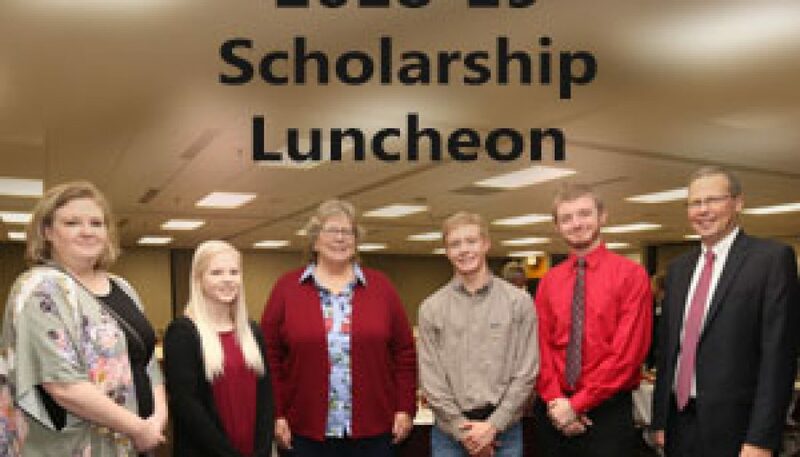 Students at North Iowa Area Community College (NIACC) who received scholarships this year had an opportunity to show their gratitude during the 15th annual NIACC Foundation Scholarship Recognition Luncheon held at the Muse Norris Conference Center on Tuesday, October 30, 2018. “This is an important tradition that allows scholarship recipients the opportunity to personally thank the donors who make scholarships possible,” said Dr. Steve Schulz, NIACC President. 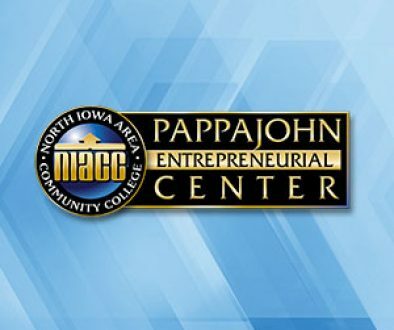 “Each student has a unique story to tell and this year’s student speakers shared their own amazing stories.” It was also noted that 630 students received scholarships from NIACC and the NIACC Foundation totaling over $1.5 million. The recognition program featured comments from Teresa “Teri” Pierce. Pierce from Lawrence, Kansas, is the daughter of former NIACC President, the late Dr. David Pierce. Pierce was joined by her mother Maureen. Dr. Pierce was the president of NIACC from 1970 to 1981. While Pierce spoke many in the room took a walk down memory lane remembering David Pierce. Pierce noted Mason City was a very formative and memorable time for their family, which is the reason they started the Dr. David Pierce Memorial Scholarship to honor his legacy, not only to NIACC but to community colleges in general. David Pierce was extremely proud of the cost-effectiveness of the community college education. They provide the same content as the universities at a fraction of the cost, enabling students to be closer to where they live and enriching lives of so many people who would not otherwise have the opportunity. Pierce reflected on the wonderful memories of life in Mason City and at NIACC. Her dad was president while she attended NIACC in 1978 and 1979. She shared bits of wisdom from her father that included the importance of relating to people, showing an interest in what other people have to say, staying humble, to learn from experiences, cherish and enjoy time with family and friends, enjoy the ride, and to never stop learning. Several student scholarship recipients also spoke at NIACC’s scholarship recognition luncheon. Parker Allen from Hampton, a second-year NIACC student studying Building Trades, shared how working for a concrete company the summer of 2017 cemented his love of building trades and working with his own two hands to create something permanent. Allen thanked the scholarship donors in the room and noted because of his donors he doesn’t have to work full- time and go to school, relieving a lot of pressure. Joni Caspers of Mason City, a non-traditional student, grew up in Swaledale. Caspers first college experience was less than ideal. She attended NIACC at 18 years old, thought she knew it all, and had no idea what she wanted to do with her life. Dropping out after three semesters, she worked odd jobs until she landed at Mercy Medical Center North Iowa as a housekeeper in 2006. Caspers loved helping the patients and their families, prompting her to pursue a certified nursing assistant certificate in 2013. The most pivotal moment for Caspers in her quest to find her calling, was the accidental drowning death of her brother in May of 2014. Caspers reflected on the incredible amount of support she received from her nurse coworkers and knew she could do the same for others who might experience such heartbreaking tragedy. Caspers is set to graduate from the licensed practical nursing program in May. She also noted how extremely grateful she was to have received the Charles and Mildred Whitney Scholarship including the opportunity to meet two members of the Whitney family at the luncheon. Patrick Hoffmann of Mason City, a non-traditional student who will graduate with his associate degree in nursing in May. Hoffmann shared how thankful he is for the scholarship he received and the difference it’s made to reduce the stress about how to pay for school. Hoffmann shared his mother was recently diagnosed with cancer and noted the importance nurses made in his family’s processing of this diagnosis. Hoffmann plans to continue working for Mercy Medical Center North Iowa once he graduates. Mikyla Marquard of Hampton is majoring in Secondary Education. Marquard reflected on being just like many other college sophomores, 20 years old, working two jobs and attending college full-time. However, unlike many others, she also has a family and is raising her two young sons, a three-year old and a 22 -month old. Marquard expressed, “The scholarships I received throughout the course of my time at NIACC have immensely relieved the financial burden for my family and me. Scholarships have put me one step closer to achieving my academic and life goals.” Marquard plans to transfer to the University of Northern Iowa to obtain a secondary social studies education degree. As the cost of higher education continues to increase, so does the need for student financial assistance in the form of loans, grants, and scholarships. Scholarship donations help students keep their borrowing to a minimum. While the College experiences great support from groups and individuals each year, the need remains for private support of the NIACC Foundation. For more information on how to help the College support deserving students, please contact the NIACC Foundation at 641-422-4386.